Falmouth Week has developed into the largest regatta in the South West, rivalled only by Cowes Week. It provides a racing schedule to challenge the most competitive sailors, yet retains a ‘fun and friendly’ feel which also attracts families and the less experienced. There are six days of competitive racing in the waters of Falmouth Bay, the Carrick Roads and the Harbour, with a Champagne Day on Wednesday and a lively shoreside programme of daytime and evening entertainment. The second week of August every year is traditionally FALMOUTH REGATTA WEEK, which combines racing for both traditional and modern yachts. There are regularly over 500 entries from Mirror dinghies to IRC yachts, including two multihull fleets. Classic’s Weekend preceeds Regatta Week. Falmouth and Port Pendennis have been the venue for many Championships and International Regattas, such as the ATLANTIC CHALLENGE, ATLANTIC ALONE and AZAB. 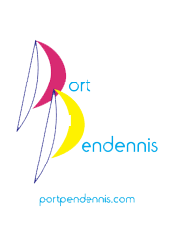 Join Dame Ellen and other record breakers in choosing Port Pendennis as your starting point. The direct access from the marina to open and uncongested sailing water for trialling together with our location close to The Lizard make us the ideal location to wait for your weather window. "Playstation" reports that we are the easiest marina they have visited for multihull access.